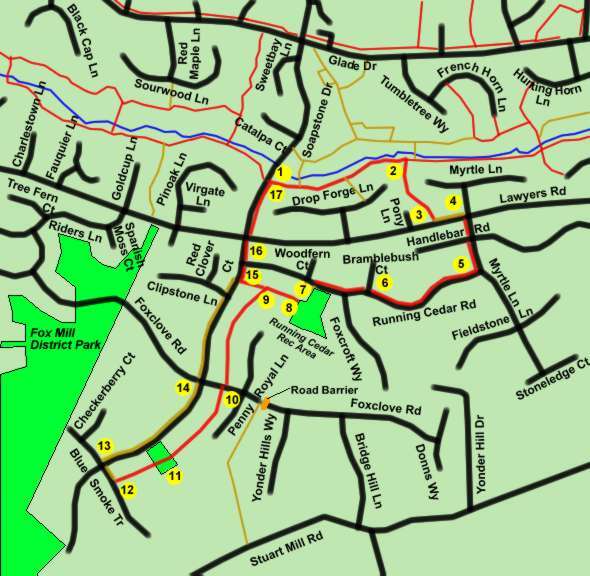 Click here for the map and directions in pdf format for printing. Click here for the start of the walk in Google Maps. This walk is different from the others. There are no trails or sidewalks on part of this walk so that it will be necessary to walk on the shoulder of the road. This includes a narrow shoulder along a short portion of Lawyers Road and a wider shoulder along Soapstone Drive. Also, the walk involves crossing Lawyers Road at a point without traffic signals. The walk starts at the Glade Stream crossing of Soapstone Drive. This is at the bottom of the hills between Lawyers Road and Glade Drive. A ‘Walker Nature Education Center sign’ marks the spot. Take the wide asphalt trail east away from Soapstone Drive. The trail intersects with Lawyers Road. Turn left and follow the narrow shoulder along Lawyers Road for a short distance to Myrtle Lane. Cross Lawyers Road at Myrtle Lane. Take the sidewalk for 2 blocks along Myrtle Lane on the other side of Lawyers Road. Turn right at Running Cedar Road and follow the sidewalk on that road. Continue on the sidewalk past the crossing of Bramblebush Court. The sidewalk ends. Cross Running Cedar Road and walk through the parking area on the other side to the baseball field. Turn right just after the parking area ends. Take the wide asphalt trail into the woods from the edge of the baseball field. A wide asphalt trail intersects from the left. From this point you may continue straight on the present path to take the short loop. After walking a short distance the path intersects with Soapstone Drive. Turn right and go to point 15 in the instructions. Turn left to take the long loop. Note that the long loop returns on the shoulder of Soapstone Drive. The long loop trail goes for a considerable distance before intersecting with a street. Go to point 10 in the instructions. (Long loop) The trail crosses Foxclove Road. The trail jogs slightly to the right here. The trail passes through the Soapstone South Recreation Area. It then climbs a hill through the trees. Turn right to walk on the shoulder of Soapstone Drive. This is not a very busy road in this section. Continue on the shoulder of Soapstone Drive after passing Foxclove Road. (Short loop rejoins long loop here) After passing Clipstone Lane an asphalt trail intersects with Soapstone Drive from the right and turns right to follow Soapstone Drive. Follow the trail along Soapstone Drive. The trail crosses Lawyers Road and continues along the side of Soapstone Drive. The trail ends at an intersection with another wide asphalt trail. Turn left to return to the starting point of this walk.